We plan to keep our family and friends updated through this blog as we go to Kazakhstan to add the newest member to our family. We also hope others in the adoption process will benefit from what is posted here. Andrew and family are doing really well. We are still incredibly busy but are hoping to settle down some in the coming weeks. Stacye and I have made the decision for her to quit work so she will be a stay at home mom starting in December. It will be tight financially but it is the right decision for our family. Lainey and Andrew will benefit having her home and available. Today with both of us working full time, every day has a stress level just getting everyone in the right place and on time each morning. Stacye’s work has been very flexible, as she has been able to come in later and pop out for special occasions with Lainey at her school and many other family things. It has been apparent how much they valued her and we thank them for their kindness in recognizing our commitment to the family. We had a good time this past weekend as Jane (sister) and Kari (niece) and Dad and Mag came in for a visit. This was Jane and Kari's first opportunity to meet Andrew and Jane was the first to get Andrew to give a kiss. Stacye and I have not been able to get him to give kisses to us since. We will continue to work on this. Andrew is teething and slobbering and growing. He has slowed down his eating and now has more of a two year olds appetite. For the first five weeks he would sit down and eat as much for lunch or dinner as Stacye or me. I think in the beginning his brain was telling him to eat all he could before the food was taken away from the table and his body was ready to accept the large intake of calories. Now that his mind understands that there is food readily available, his body is telling him it is full and it’s okay to stop eating, even if there is food still on the table. It has been a fascinating transformation to watch. I do not think that I will ever forget the plane ride home from Kaz when I first saw his base motivation compared to another child. We sat beside a fifteen month old little girl and her parents for ten hours. When the baby bags were opened for each, she wanted to check out his toys to see what she could play with in Andrew’s stash. At the same time Andrew looked directly past her toys (I mean zero interest) and only wanted to know what food she had in the bag. There was such a stark gap in their motivations. Now that his body seems to be satisfied with his nutrition, Andrew is now becoming the toy connoisseur like his plane mate. He is just doing great! I keep thinking I will blog more and tell you the stories of the day but it is pretty boring. We are back into a routine now and Stacye and I are much more fatigued at the end of the day so I have basically chosen sleep over blogging...sorry. Also I can't bring out the laptop without Andrew wanting to type. He is so funny, he keeps reaching to hit the keys and when I brush his hand away he has this look on his face like “don’t you know I am helping here”. Most of you want to see pictures anyway so here you go! Sorry we have not blogged in a while, I will try and catch everyone up on our activities since we have been home (if I don’t fall asleep). Andrew has adjusted so well. He has done better than we could have imagined. Our prayers have truly been answered. We took him for his first pediatrician visit Sept 21 and he did really well. He was traumatized by five vaccination shots and a blood draw but after we left there he was immediately in a good mood and we took him out to eat. All of the blood tests came back good and the dirty diaper we left behind with the stool sample showed no intestinal bugs. He is still eating everything and growing and getting stronger. His weight has increased 30 percent in three weeks. He was weighed at the SOS clinic in Kaz at nineteen pounds on Sept 10 and his latest weight was twenty five pounds on Sept 27th. I think most of the new weight is muscle as he has gotten so much stronger. 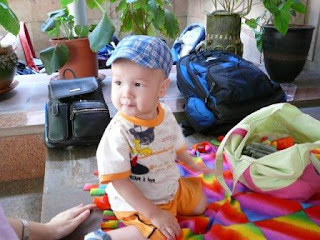 He was only taking a few steps without assistance when we left Kaz and is now walking more than crawling. It is amazing what the extra nutrition can achieve in his little body and the extra love can do for his spirit. He laughs and gives big bear hugs and has truly just fit right into the family. It is hard to explain, but it feels like he has been in the family forever. I am about to fall asleep so I will upload this quickly and blog more later. We left Almaty right on time Friday 9/14. We had two flights to get home, one seven hour and one ten hour, so we were in coach seats for seventeen hours with a three hour lay over in Amsterdam. Both flights were smooth and Andrew did well. He did great on the first seven hour flight and showed no signs of being scared. The second flight he got a little grumpy about two hours before we landed and I had to get him up and walk him around a while. He cried for about ten minutes during the landing process but otherwise he made it great. Immigration was a breeze and we came through after about a five minute wait on the officer to do his paper work. There were about a dozen friends and family waiting in the lobby of the airport with balloons and greetings. Wow, it was so good to see their faces and their excitement. 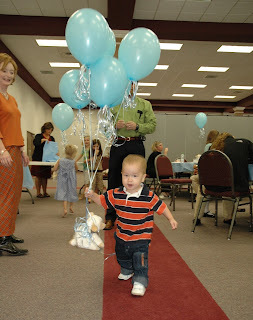 Andrew was not sure how to take all of this excitement so he was pretty timid. Stacye and I were so tired we may not have appeared to be excited but we were sincerely appreciative and soaked up the well wishes and the kind extra effort everyone made. We visited for a while and then retrieved our luggage and made our way out of the airport to go home. We walked in the house about 8:00pm and started showing Andrew his new home. He took right to his big sister Lainey showing him his room and his new toys. If he was intimidated you couldn’t tell, as he made his way through the entire house. He is walking better now but he also still crawls if he wants to get somewhere fast. He has had a little trouble sleeping (as have his mom and dad) with the time change. He slept through the night (ten hours) in the hotel room in Almaty each night so he should be on track to sleep through the night in the next couple of days. Overall he is doing amazingly well. He gives big hugs and laughs quite a bit when he is not eating. And he is spending a good portion of his time eating. He has not turned his nose up at anything we have offered, from jar food to table food, he has eaten it all. We have his first pediatrician appointment Friday and we are interested to know how much weight he has gained. We are so glad to have him home and all of the stress we went through to get him here is becoming a more distant memory. September 12th was a wonderful day. First, we spoke with our daughter in the morning and she and Shin Shin were making signs for Andrew’s coming home grand entrance. It’s fun to see how excited she is about being a big sister and how much she already cares for Andrew. Next, our visit to the US Embassy couldn’t have gone more smoothly. They even commented on how good our paperwork looked. It took all of 5 minutes. We have constantly been on alert that revisions might be needed, something else to be done, etc, just based on our experience throughout the entire process (even while we prepared in the US). I think that is the reality of international adoption, particularly Kaz. The words “be flexible” are used A LOT. It was just great to have something go so easily. We brought all kinds of paperwork with us just in case and it wasn’t even needed. So now, we’re DONE. We will pack to go home and be on a flight Friday – with our son! ALSO, we have a new nephew. 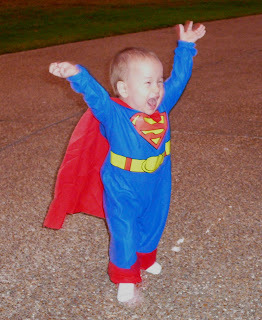 I just received an e-mail from my Dad that my brother and his wife just welcomed their 3rd son. Both mother and baby are doing well and my brother is walking around the proud papa. Yep, he was born on September 12th. It just keeps going – Andrew has been walking with our assistance since we met him in June. He was shaky but would walk while holding our hands. A few times he "walked" between us but it was more of a fall into us. 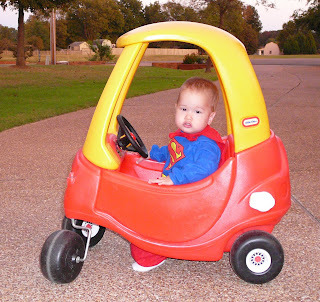 Of course, we have left twice in this process and did not see any real improvement towards walking unassisted. Since we’ve had him with us full time, we’ve been letting him walk by holding on to furniture all over the hotel room. He also loves to stand in our laps and bounce up and down. We thought his legs had to be getting stronger from all of that bouncing but we were prepared for some possible physical therapy at home or other help if it looked like he might need it. It turns out, he just needed a little extra time and attention. Last night (Sept 12th), I looked up and he had let go of the bed and was taking steps on his own. Tears came to my eyes. He kept trying and would take about 2 steps before falling down. We weren't even next to him when he struck out on his walk. It’s just amazing. We’ve only been together full time for 7 days. Finally, September 12th was our 9 year anniversary. Together, we have spent 7 weeks, 24 hours a day in a foreign country, spread over 3 trips by very long plane ride and we are still each other’s best friend. I couldn’t imagine my life with anyone else. Here finally is the first picture posted on our blog of Andrew. 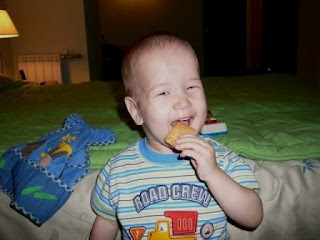 This is the type of cookie that we gave Andrew each day in the BH and he still loves them – as you can see from the smile. He has really blossomed in the five days he has been in our care. He is talkative and into everything, he also laughs a lot and at times can be very loud. This is new coming from the reserved little boy we knew in the BH. We are very pleased with his gregariousness as this is a good sign that he is bonding well. He makes us laugh so much as he tries new things. He is such a quick study. He points the remote at the TV (must be the male gene), gives us 5, and tries to put his clothes on. It is so interesting to watch him because he is so small for his age (9 month clothes) but really has the hand eye coordination of a 2 year old. He can feed himself from the baby food jar with a spoon which is interesting to watch. We feed him most of the time for bonding but he likes to try. He can do a great job with scrambled eggs. We went to the SOS clinic Monday and he did really well. We got a little more information about him from the SOS doctor. We did not receive a lot of medical history from the BH so we were very interested in what records the SOS clinic had received on him from the BH. We were told by other adopting parents that most of the information that we would receive on Andrew would come at the end of the process – at the SOS and embassy. This seems unique to Almaty City adoptions from what I have been able to find/read. Our coordinator, Assiya, is expecting his visa Wednesday morning. It will come by train from Astana. There are certain requirements for various documents. From our understanding, the visa application must travel by train with a certified courier. As we find out more about the process, it’s easier to understand how Kaz adoption is more an art than science. We read that in multiple places in our agency’s documentation and it is so true. Requirements change and trying to know exactly what order & how to time everything seems to be tough. Assiya and Saulea (translator), came by last night to go over the US Embassy forms so that they could have them to turn in first thing Wednesday. Anyway, we should have our embassy visit scheduled for Wednesday afternoon. This puts us on schedule for our flight out Friday. Thursday is a spare day to take care of anything that might come up. We really miss Lainey and we look forward to big hugs from her when we get home and having our family united in the USA for the first time. Well we have had Andrew for three days now and all is very well. He has adjusted better than we could have hoped. The first morning with us when he woke up he seemed a little upset but he may have been more disoriented by waking up in a different environment. He shook it off and became himself before breakfast. The hotel here has agreed to make porridge (kasha) for him each morning as part of our complimentary breakfast. (I will post their praise later) That is his comfort food because that’s what he had at the baby house each day. However he has shown to be an adventurous eater. Each morning in addition to porridge we give him some fresh fruits and scrambled eggs (which he really likes) from the breakfast bar. He eats nearly nonstop for thirty minutes. 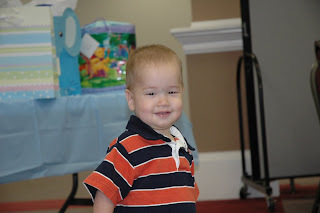 We are content to let him get his fill since he is not even on the growth chart for weight. He handles the intake very well. (For those who can’t handle poop talk, skip the rest of this paragraph). However, we have reaped the bounty of all of this new consumption in the form of at least two Chernobyl diapers, they were complete blowouts. All we could do was get him into the shower, clothes and all and wash him down. During these occurrences I felt like I should have on one of those level 4 bio-hazard suits. The good part (the good part, I’m talking about poop here) is that it is not runny; there is simply not enough capacity in the diaper. 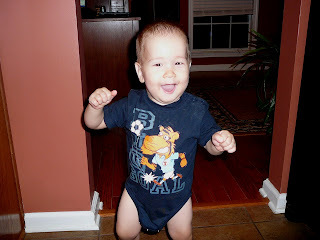 We also had him in the wrong size of diapers so we bought some smaller ones and that has helped with containment. Friday Stacye bought some pre-prepared beef dish at the grocery store. It was beef, tomatoes, onions, and carrots and she saved what she did not eat. Saturday night she opened it to finish and Andrew crawled over for a visit. 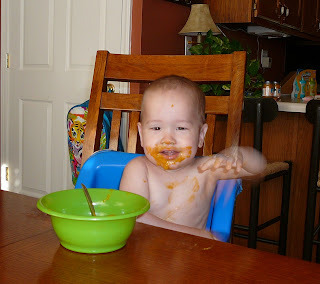 He wound up eating all of the vegetables and then finished off a jar of baby food. We have determined that his system does not hold onto the baby food with meat, so we are feeding him mostly fruit and veggie food from the jar. He is sleeping well also. He has slept through the night each night we have had him. The baby house gave his age group a bottle at 12:00pm so we get up and fix the formula and he will drink it without completely waking up. It is pretty cute to watch and it reminds me of when Lainey was a baby. He will open his eyes, recognize the bottle and latch on and drink it while he falls back to sleep. You better give him enough though, because he will cry if he wants more. It is so amazing how well Andrew is adjusting to us and all the changes. He laughs easily and gives great big bear hugs. We have prayed so much for Andrew’s adjustment and we have seen so many answers all through this process and as we watch him blossom a little more each day. For example, the first night in the hotel he would not move from any place we put him down. He would play just in that spot. By day three, he’s everywhere and into everything which is what you would expect of a little boy. I promise we will be posting his picture soon we are just being cautious. We got pepper's dog from a shelter that found her on the side of the road.